This level has medium difficulty. 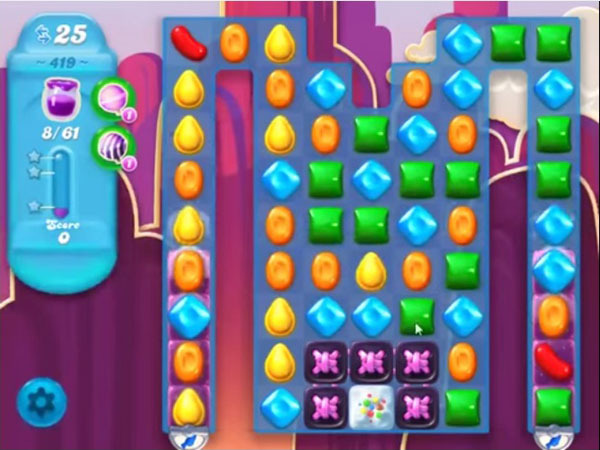 For this level try to from middle part of the board where more candies available to play to make special candy. Try to make striped candy combo to spread more jams or play near to jam candy to spread to all over the board. I’D SURE HATE TO SEE A LEVEL YOU CONSIDER VERY DIFFICULT!!! IT SEEMS LIKE EVERY LEVEL, NO MATTER HOW FRUSTRATING IT IS, YOU SAY “THIS LEVEL HAS MEDIUM DIFFICULTY”. THIS LEVEL IS DOWNRIGHT IMPOSSIBLE!!! I CAN’T GET THE JELLY TO THE MIDDLE OF THE BOARD AND I HAVE TRIED EVERYTHING!!! I’VE TRIED MIXING FISH CANDIES WITH STRIPED CANDIES, I’VE TRIED USING HORIZONTAL STRIPED CANDIES, I’VE TRIED MIXING POWER BALLS WITH FISH CANDIES. I HAVE TRIED EVERY COMBINATION I CAN THINK OF AND NOTHING WORKS! I AM JUST ABOUT READY TO QUIT THE WHO GODDAMNED THING!!!! !